Lisa and I went to check out the Monday recession special at Irving Mill, which includes their signature cheeseburger, a tall glass of beer and a shot of whiskey all for $15. We've heard that the burger was good but we didn't expect such yumminess. The atmosphere at Irving Mill is gorgeous and rustic, with exposed wooden beams, small lanterns and lots of open space. However, we didn't get to take full advantage of it because we chose to enjoy the gorgeous weather instead and sat outside. The small sidewalk area was lovely, with large umbrellas and comfortable chairs to sit on. We didn't feel cramped or forgotten, which is sometimes the double-edged sword with outdoor seating. Irving's location is also great in that it rests on a relatively quiet street, away from the hubbub of Union Square. Lisa and I both ordered the burger, as planned. We had reservations, as some recession-specials turn out to be disappointing, but not this one. 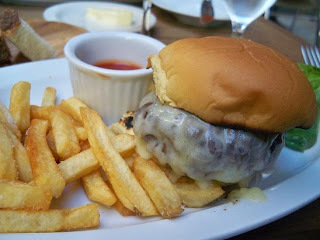 The Burger - As is customary with recession specials, the portion was smaller than usual. However, we didn't mind, as it turned out to be just right for both of us. The burger meat itself was cooked perfectly (medium), according to our wishes. There was a thin film of white cheddar cheese on top, which provided just enough saltiness and bite. The crunchy fries, on the side were also delicious albeit a little greasy. The beer that was served with the burgers was a full-bodied wheat ale that was both filling and flavorful. Overall, we were satisfied and devoured our burgers to the last bite. Our waiter was nice and respectful of our wishes. Although he encouraged us to get dessert, I didn't feel like he was pushing us into ordering more food. He was pretty laid back and friendly. Was a great deal and I liked the outdoor seating! Def. would go back! yeah the outdoor option was great.